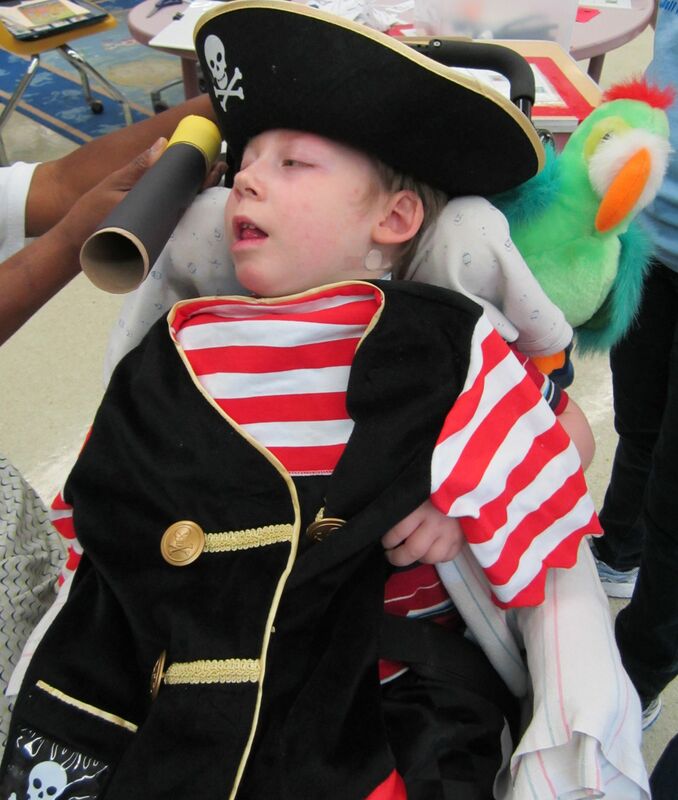 Avast ye land lubbers—-we celebrated Talk like a Pirate Day this week. Cara had written such a great book last year that we used it again. Repetition is always good for our students and helps reinforce concepts and language learned. 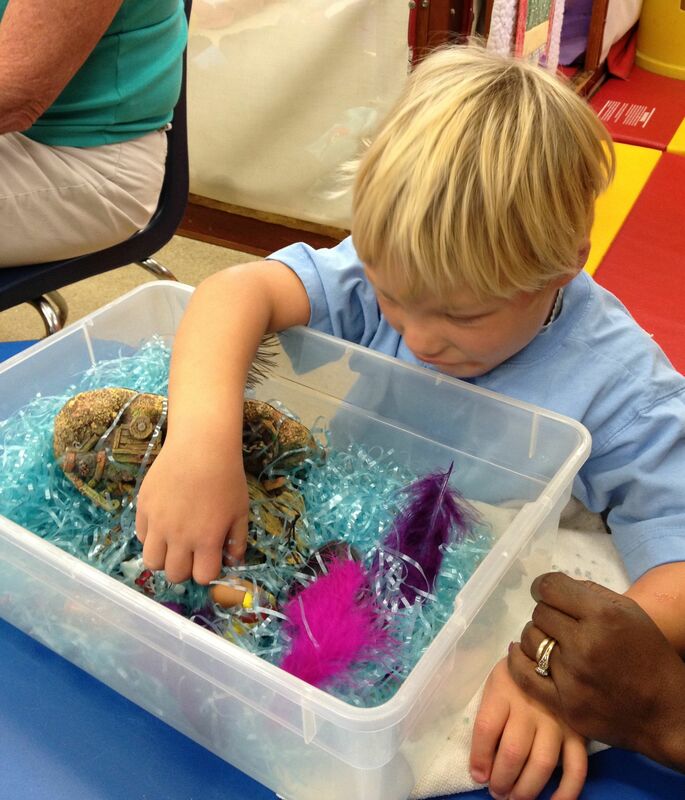 We kept some of the same sensory boxes but did add a few new ones. 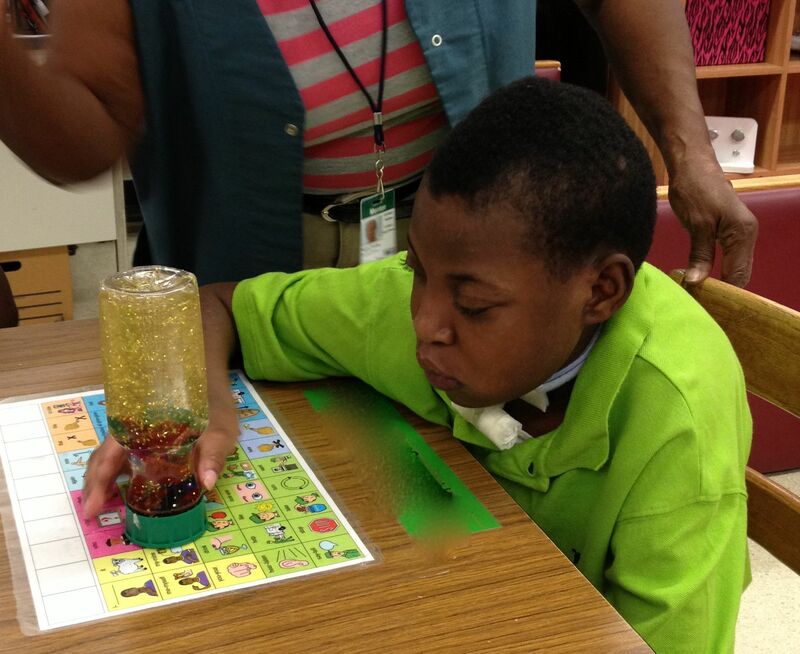 Our fine motor and language group activities were different from last years celebration. We filled this box with some basket filler in a pretty light ocean blue. Then added some cool pirate stuff like a shipwreck (from an old aquarium), black beads and pom poms, an eye patch, and “parrot” feathers. Rubber duck and action figure pirates completed the box. Visual discrimination skills are targeted as students look through the box and decide which items to pick up and examine. The language access point responding to new vocabulary that is introduced and taught directly, is addressed in this activity. 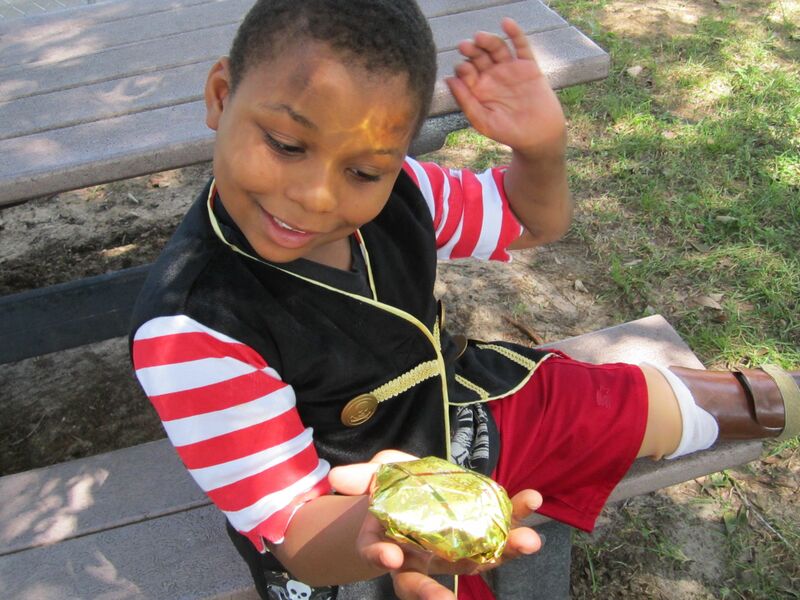 Pirates are always looking for buried treasure on deserted islands and X marks the spot! Our students were able to stamp an X in the sand with their cookie cutter. Shifting the sand aside reveals a treasure map and some gold coins taped the bottom of the box. Math skills are addressed as the hidden coins or stamped X’s are counted. In addition, applying a push or pull to move an object, such as stamping an X or pushing the sand aside, addresses science access point. If you find the right spot you can dig up a treasure chest filled with GOLD. 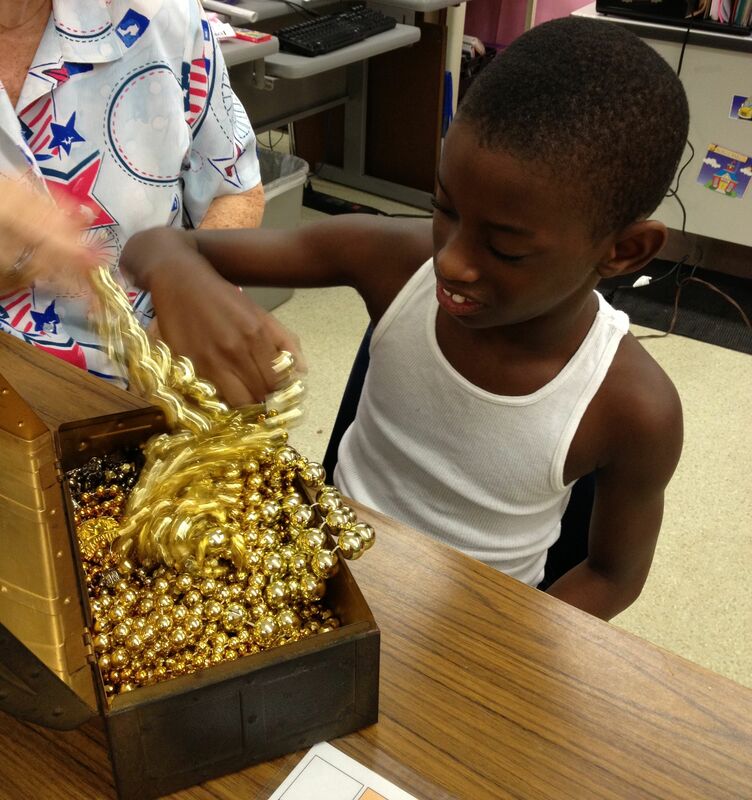 Our students just couldn’t resist grabbing these gold beads by the handfuls! 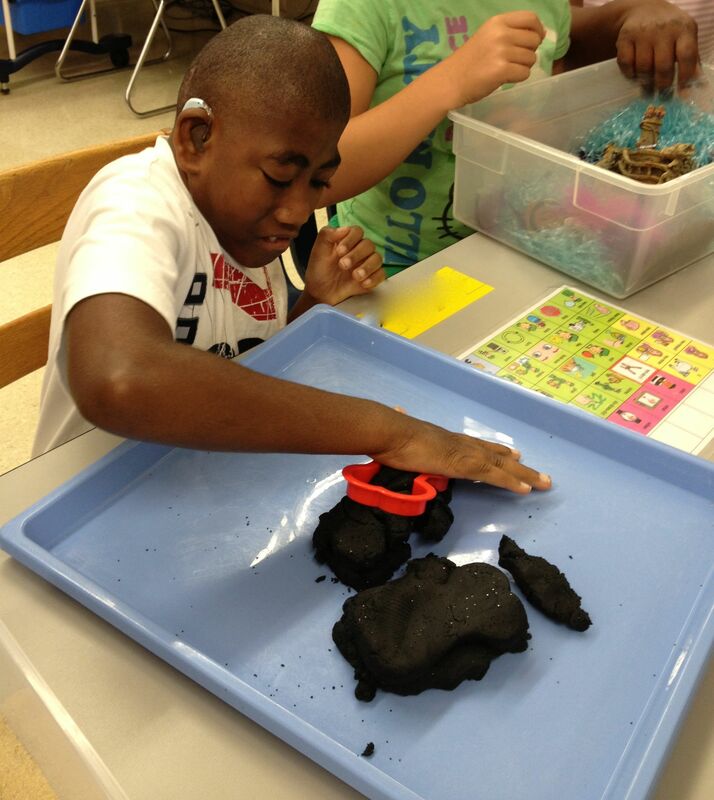 Exploring, observing, and recognizing objects in the natural world is a science access point. More treasure was contained in our discovery bottle. Filled with plastic jewels, gold glitter, water and corn syrup—-the bottle swirled and glittered as it was shaken. This was a really one of the prettiest bottles we have made—-very, very eye catching! Picking up and grasping the bottle addresses eye hand coordination and gross grasp skills. Recognizing that pushing or pulling an object makes it move and tracking objects as they move are science access points. 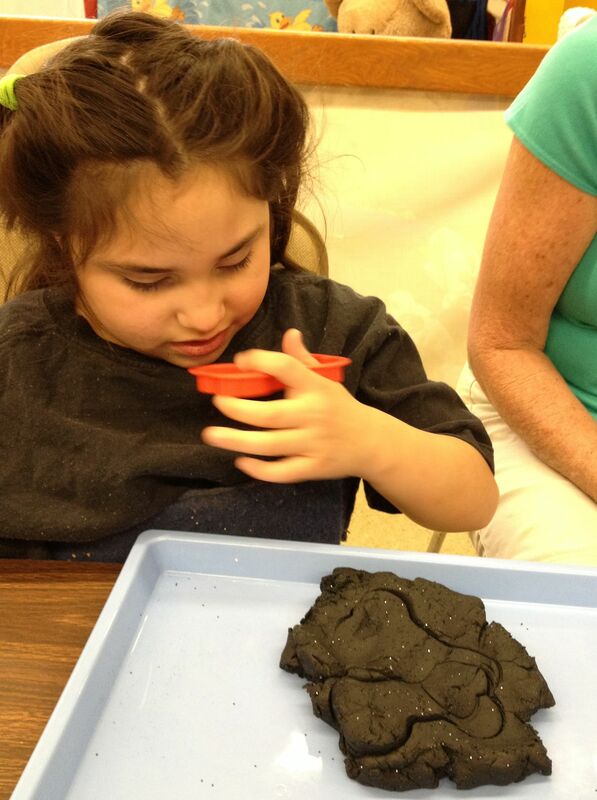 Our students could roll the playdough into cannon balls or use the bone shaped cookie cutter to make shapes. Squeezing, pushing, pulling and otherwise manipulating playdough is great for strengthening hand intrinsics. This activity addresses the science access point of recognizing that the appearance of an object or material has changed. 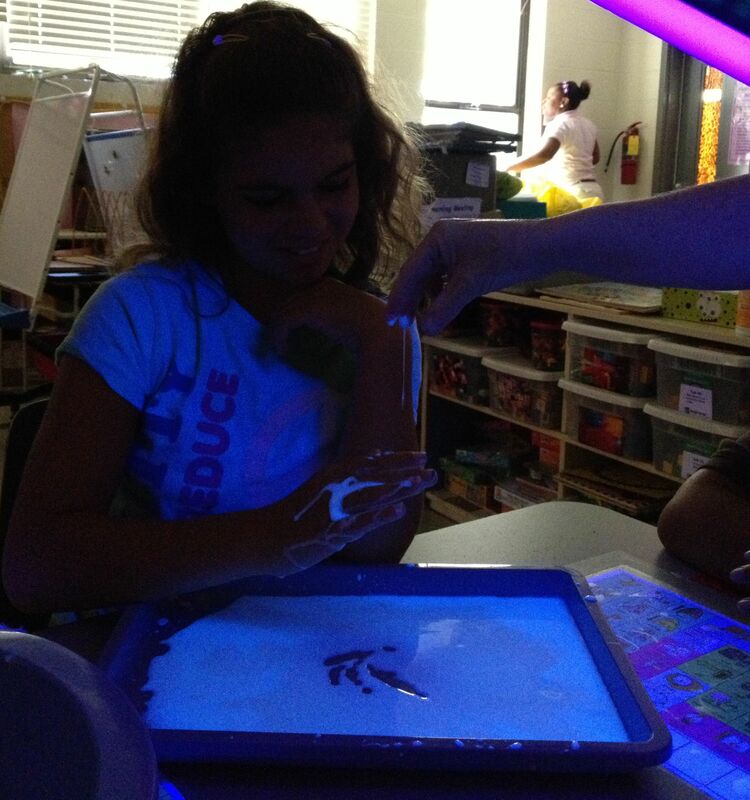 Then we turned off the lights and turned on our black light to help us explore our pirate swamp! We mixed up our oobleck using tonic water, which contains quinine, instead of ordinary water to help give it even more glow. Our students practiced making prewriting strokes and the letter X in the oobleck and really had fun watching it drip and flow down hands! 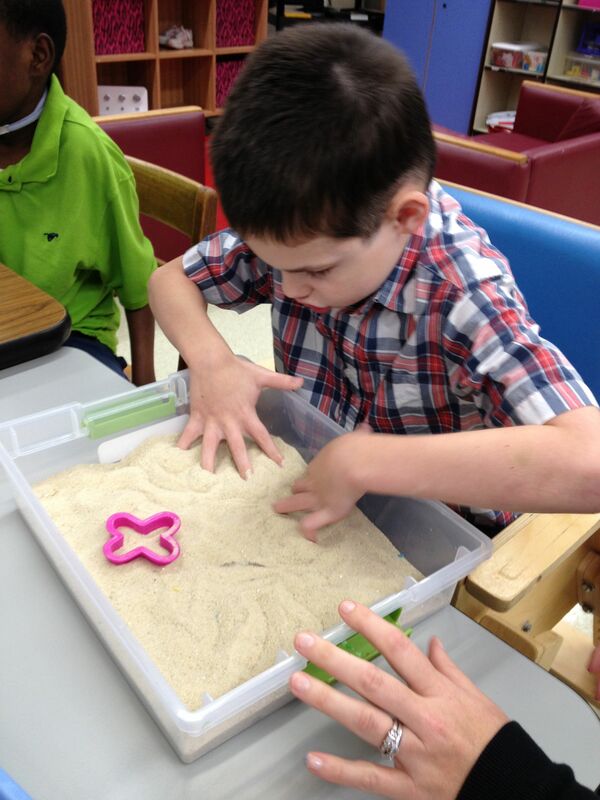 Using the senses—-in this case vision and touch—to explore objects is a science access point. Tracking the oobleck as it flows also addresses a science access point. A large measuring cup and measuring spoon were available in the water bowl for scooping fun. The science access point of recognizing and responding to one type of sensory stimuli is addressed as the water spray comes down. The math access point of recognizing differences in sizes of containers that hold liquids while scooping. As usual, we also used the companion lotion to help our students learn external body parts and address the math access point of indicating a desire for more of an action or object. 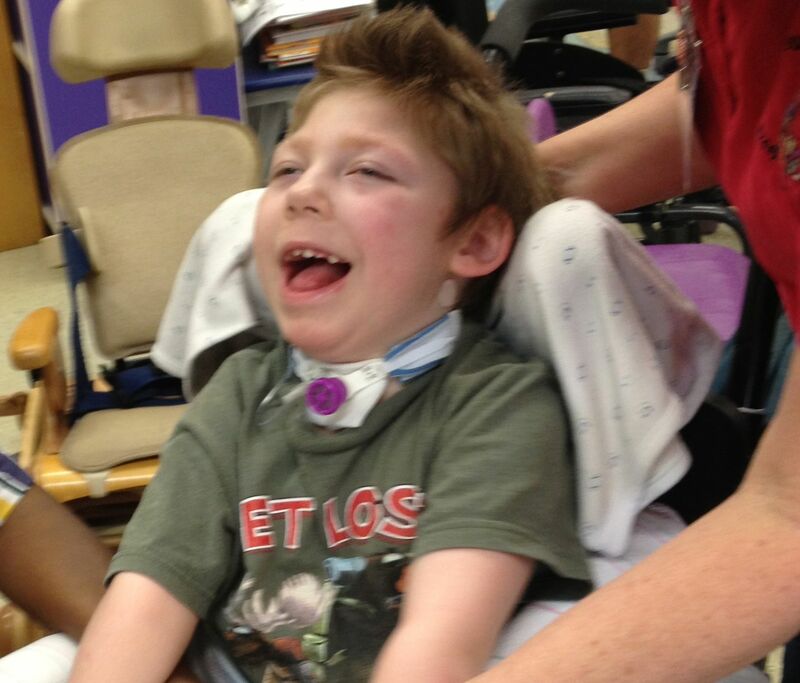 This also addresses the science access point of recognizing external body parts. 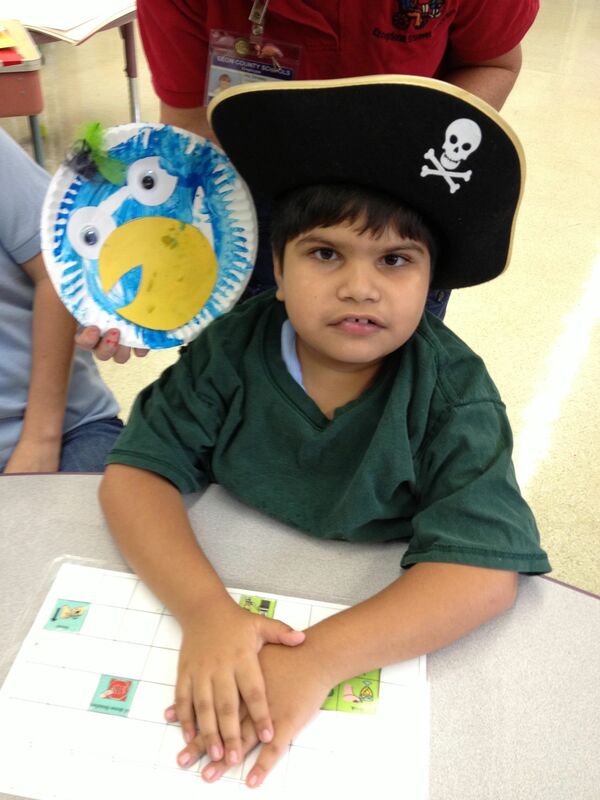 Every pirate needs a pet so on Tuesday we made a paper plate parrot for our art project! 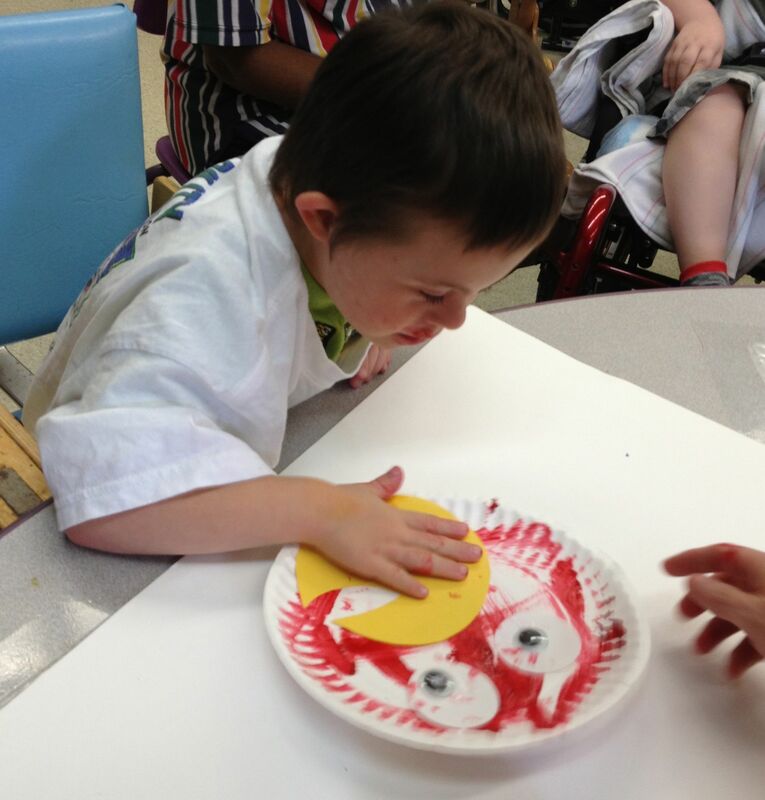 We counted out a circle shaped paper plate for each student then gave them a choice of 3 colors to paint their parrot. Since the Florida Alternate Assessment has an array of 3 format, we like to give our students lots of practice making choices out of sets of 3. 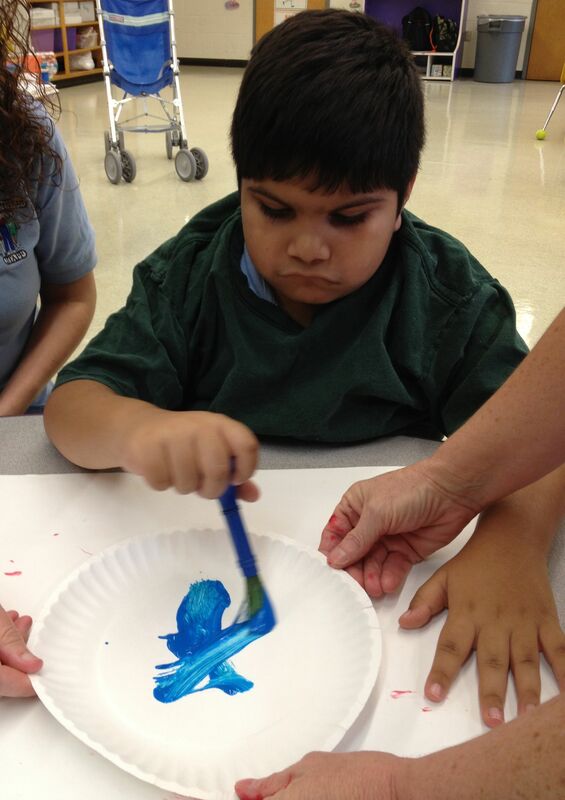 Our students are getting to be such good painters! Recognizing a common object with a 2 dimensional shape is a math access point. 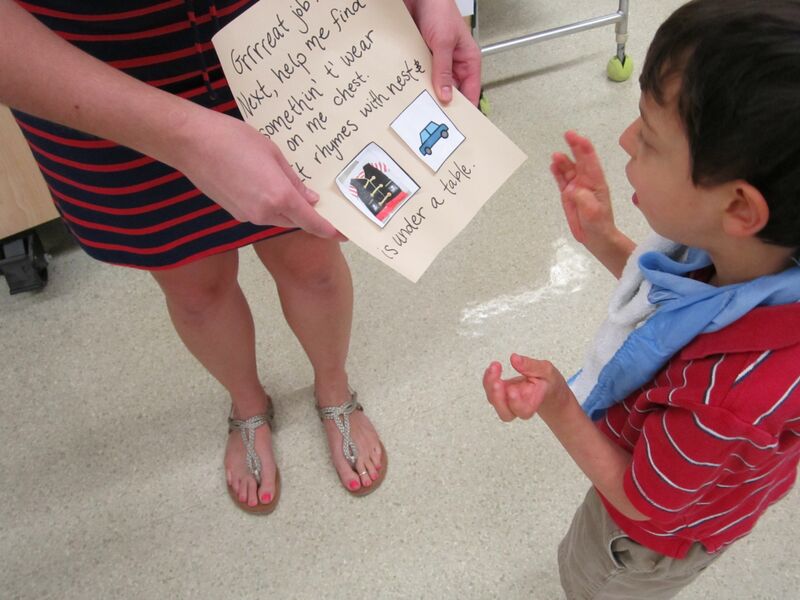 Effectively communicate wants and needs to a familiar person using referent objects, gestures/signs, pictures, symbols, or words is a language access point. Then we used our circle cutter to cut out 2 small circles. We glued these onto the paper plate and added 2 googlie eyes on top. We also added a precut beak and some fluffy feathers. Picking up and placing the smaller pieces promotes pincer grasp and finger isolation skills in addition to eye hand coordination. Recognizing differences in size of objects and associating quantities 1 and 2 with number names are math access points. Looks like Polly parrot is ready to set sail! We used paper towel and toilet paper rolls that fit inside each other—-to get telescoping action, way cool! They were decorated with paper strips. 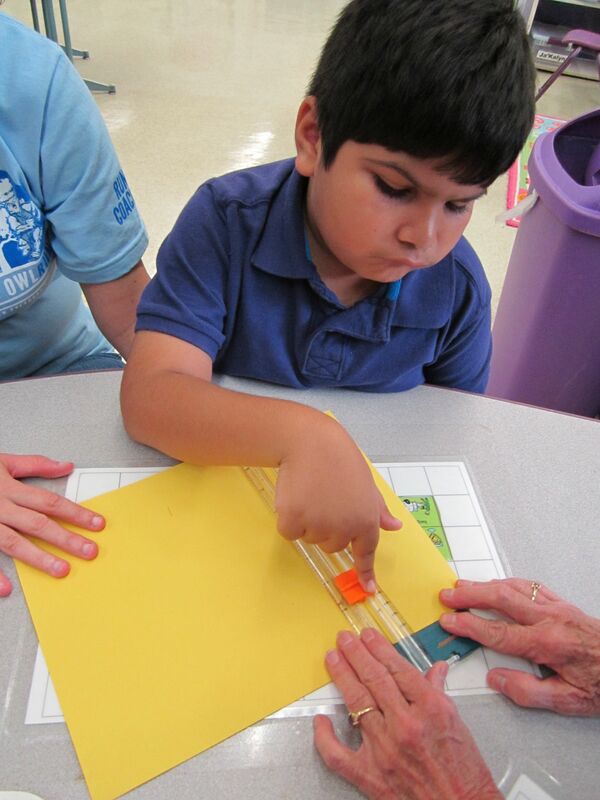 We started by using our paper cutters to cut rectangle shaped strips of paper and taped them to the rolls. 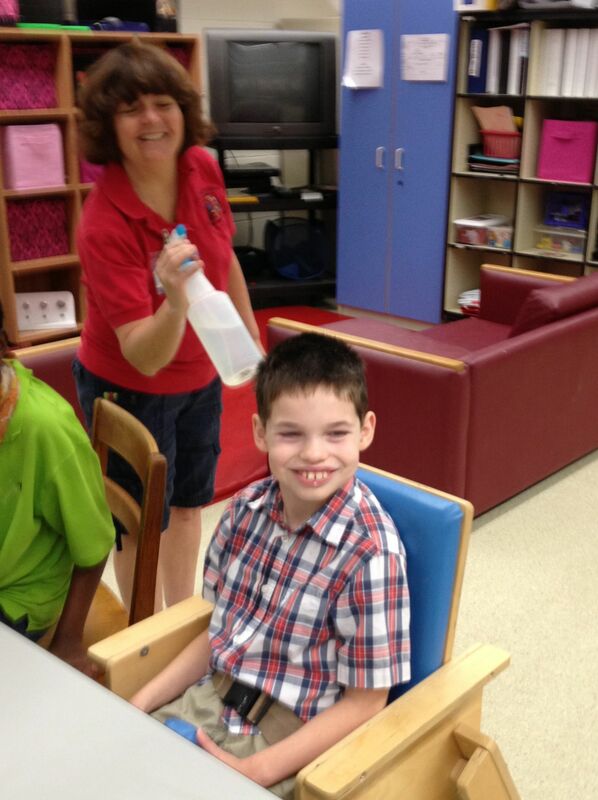 The electric scissors attached to a switch were used for our students with physical impairments. Recognizing a change in an object ( as the paper is cut) and recognizing a model of a real object are science access points. Recognizing a common object with a 2 dimensional shape (the rectangular paper) is a math access point. The strips of paper were taped around each roll. We discussed the fact that one roll was large and one was small—-addressing the math access point of recognizing the differences in size of objects. 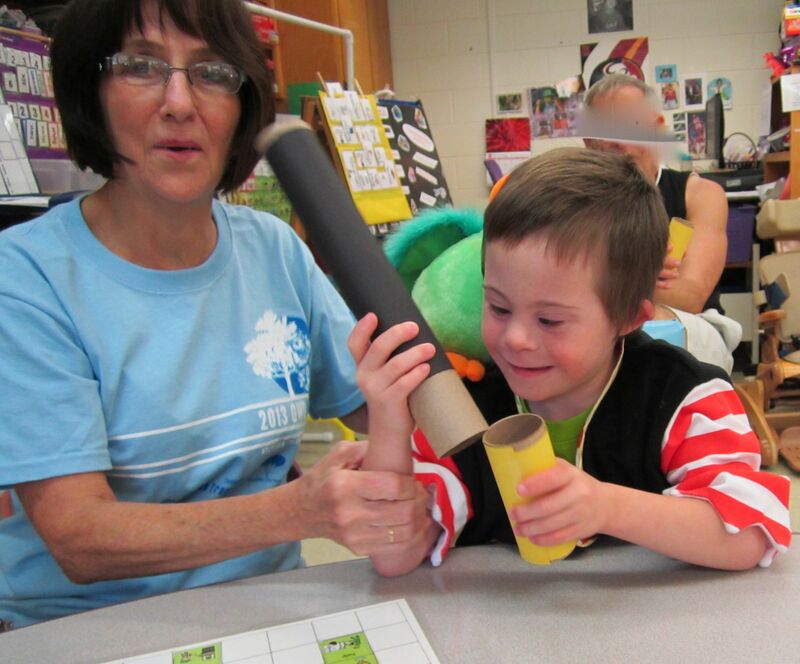 Bilateral coordination and eye hand coordination are addressed as the paper is taped around the roll and as one roll is inserted into the other! 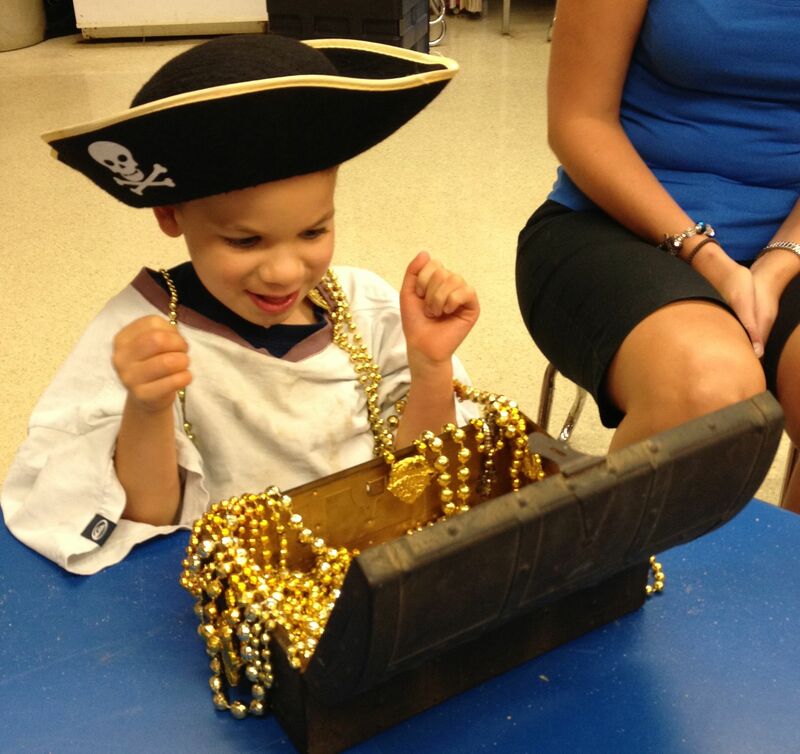 A pirate came by and left clues to his buried treasure in our language group. 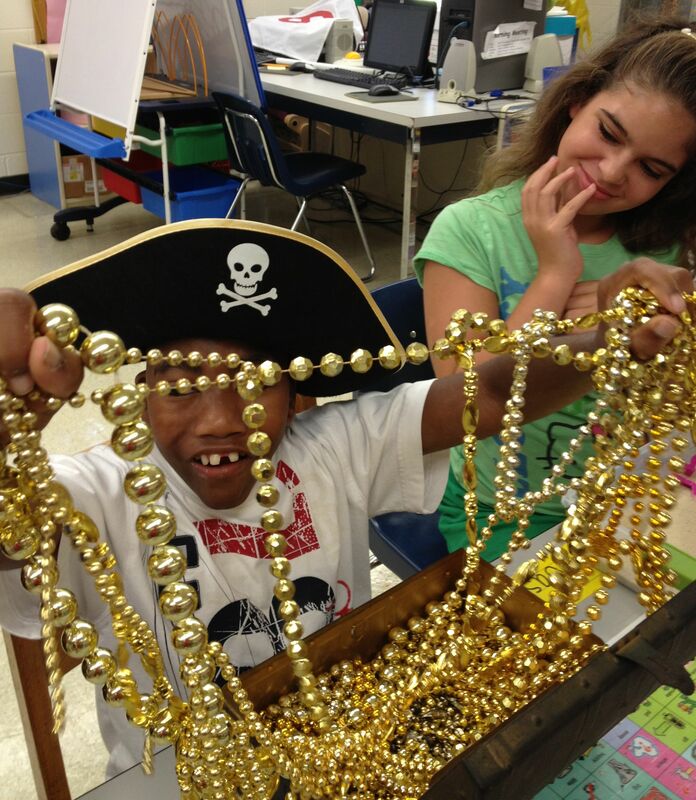 Our students had to use the clues to find the hidden treasure. Each of the clues incorporated a preposition, like “up”, “next to”, “under” and “on”. They also had a rhyming word to help figure out what to look for. For example, “this thing rhymes with carrot. Is it parrot or car?” The students did such a grrrrrreat job figuring out the rhyming words and finding the things associated with pirates. Using pictures, symbols, gestures/signs, or words to communicate meaning. 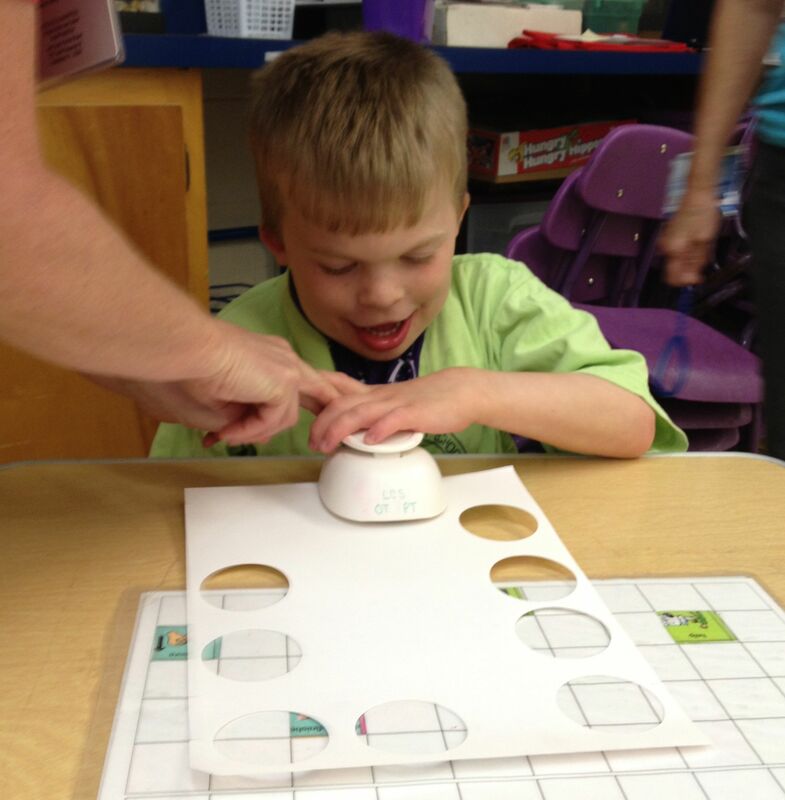 Recognizing a movement that reflects a spatial relationship is a math access point. 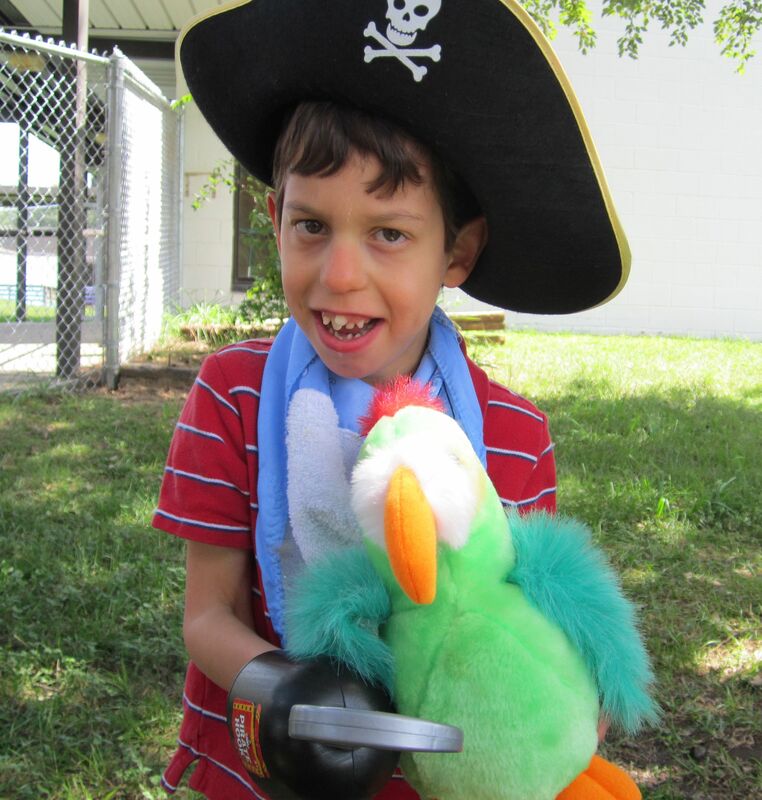 Hidden around the room and also outside were a parrot, a pirate vest, a hook, a pirate hat, and of course, the hidden treasure on the X.
Recognizing the next step in a simple pattern or sequence of activities is a math access point. Associating information with referent objects is a language access point. 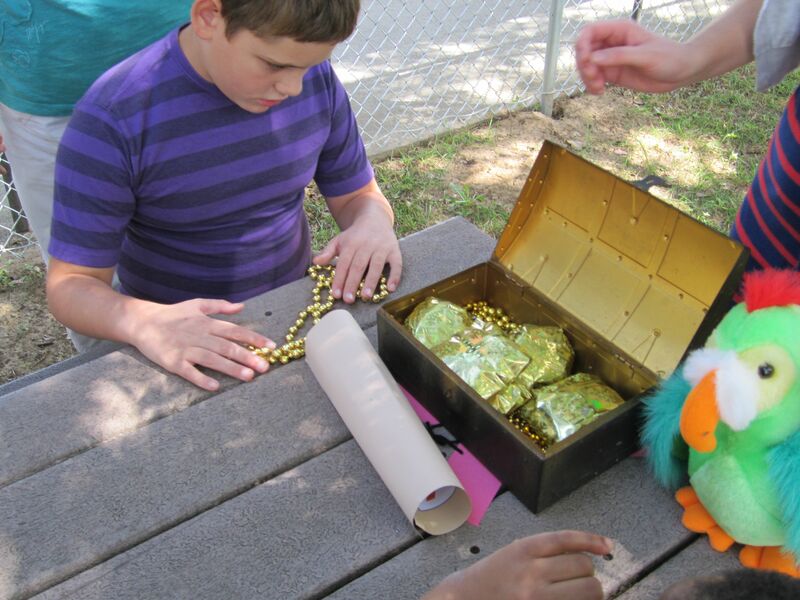 When the students found the treasure, they opened it up to find a little treat wrapped in gold wrapping paper. Excitement galore! Arrrgg, be sure to ship out with us next week for more fun and learning, Group by Group!